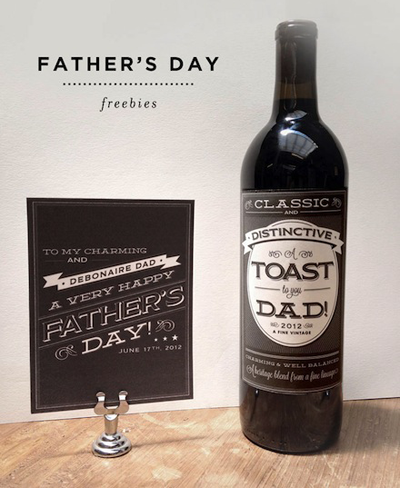 Have you seen these awesome printable cards and labels for Father's Day? They're compliments of Hello!Lucky, where you can download them for free. Assemble a gift for Pop with coordinating sock bands and beer or wine bottle labels, then jot a note in a matching greeting card. 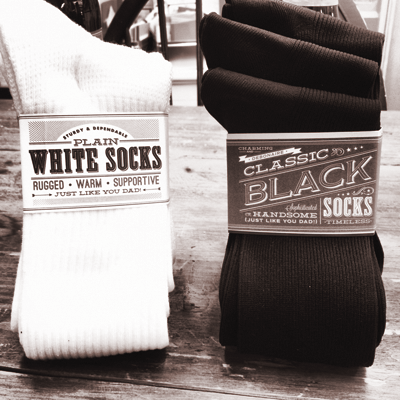 Choose from black or white designs. Very manly and cool, and totally beats the zillions of golf and fart-themed cards found in stores, right? Is that because I said fart? I know, but have you looked at the cards at Walgreens and Target? Flatulence everywhere! But then again, you don't have those stores in the boonies, so you're probably spared the vulgarity. I love the gift stuff! What a great idea for a man package. I agree with Judy, Jess - you and your mum make me laugh! Interesting ideas. Love giving my dad socks as a gift ever since I a kid. Taken note of that dad's day message. :) Got my eye on your blog now. whenever i see something i love in orange i think about you're blog :) have you seen these on sale? also, at the dollar section at target there's some really fun orange gift bags.